Legalese: This post contains affiliate links. By purchasing through my links, I receive a small compensation (for more sewing *of course!*). In exchange for this review, I was provided the full issue. All opinions, comments and thoughts are all mine. Oh my squee!!! Temperatures may be falling here in the Northern hemisphere, but we're gonna party like it's heading into summer because it's ONE THIMBLE time!! 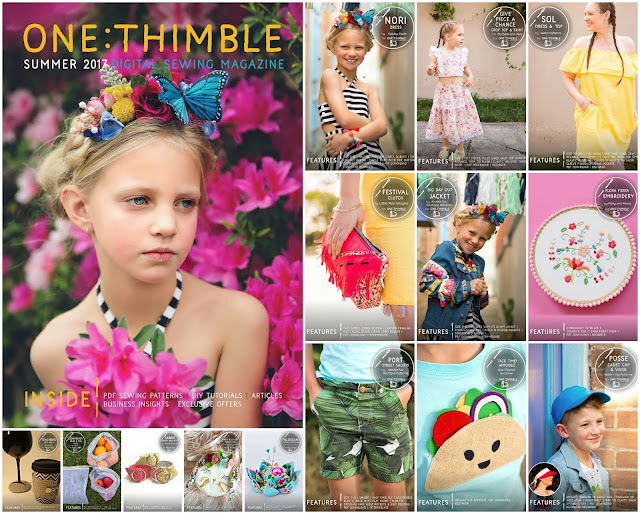 Issue 17 of One Thimble is a fiesta -- packed with fun patterns, inspirational articles and so much more. After I share the details on what I've created, you can read my review on the whole issue. In case you are new to One Thimble, it is a quarterly digital sewing magazine with about 10 or more sewing patterns and several inspirational articles and quick tutorials. 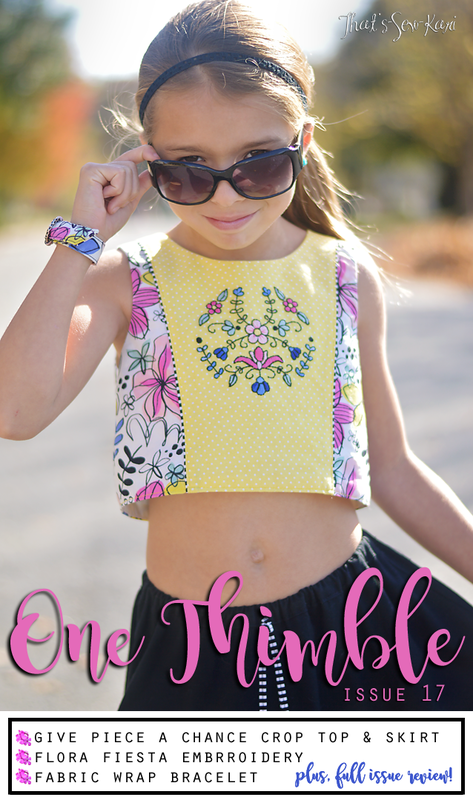 This issue has 14 patterns, including the winners of One Thimble's "Gifts to Sew" Contest. The cost for everything is $25 AUD (which is $19.15 USD) -- that's just $1.79 AUD per pattern ($1.37 USD)!! Buy your copy HERE! If you grab it before Nov 13, you also receive the cutest printable calendar for your sewing space!! Teacher's Gift Pack | .one + two. The Give Piece a Chance Crop Top and Skirt set is by Duchess & Hare. It features a cropped, fully lined sleeveless top and a tiered, mid-calf length elastic-waisted skirt. The top portion of the skirt is a half circle skirt and the lower portion is a gathered rectangle allowing you to mix and match fabrics and even include a border print. The top is pieced together with optional flounces flanking the center panel. The center panel is perfect to feature a favorite print or embroidery. Because it's fully lined, all the seams are neatly tucked inside. I found the perfect funky floral fabric at Hobby Lobby that inspired the whole look and used a small white dot on yellow to feature the Flora Fiesta Embroidery, making it pop in contrast. I also added faux piping in lieu of the flounces. I used matching embroidery floss from Hobby Lobby for the embroidery. For the skirt, I used a solid black cotton. I added the tie at the waist, partly for visual appeal, but also so my daughter can tell where the front of the skirt is! The back of the top features the same paneling as the front and closes with buttons. 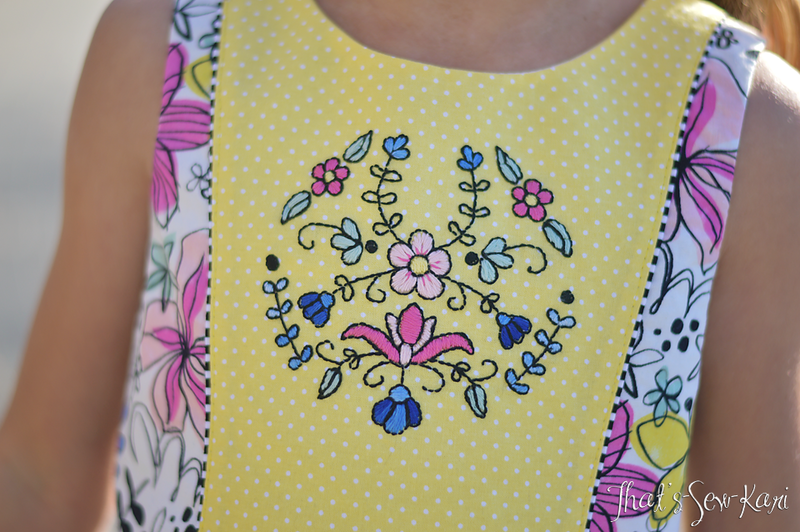 The Flora Fiesta Embroidery by Molly and Mama is my favorite thing!! I have always wanted to try my hand at this and I decided this would be the issue that I would go for it. I'm not going to lie, this took me f-o-r-e-v-e-r to embroider. I took my little bag to carline, my girls' choir practice, pretty much everywhere I went. I sat up late several nights stitching after my girls went to bed. IT WAS ALL SOOOOO WORTH IT! If you have never tried it, please make it a goal to give it a go. I am hooked! I went a bit nontraditional and outlined the embroidery in a black thread. Then I went back and filled in with color. I think the outlining ties the look together with both the fabric on the side panels and the black and white stripe faux piping. 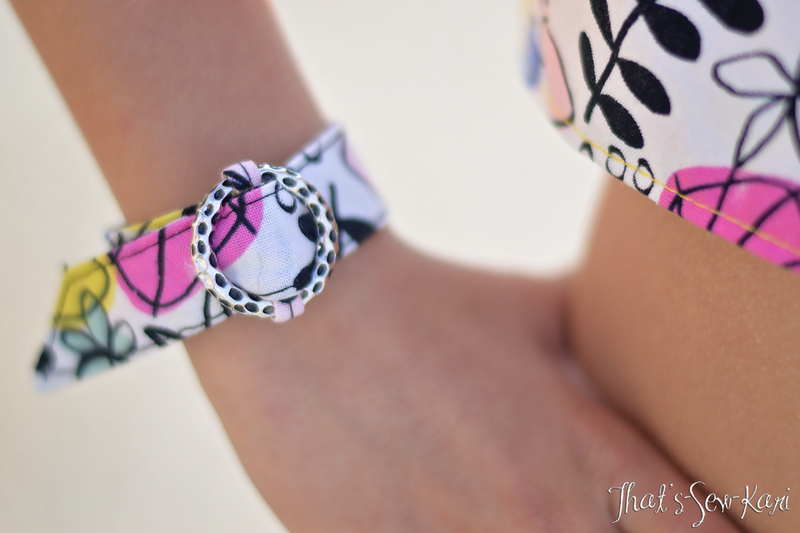 I thought the Fabric Wrap Bracelet by Sarah of Pattern Revolution would be the perfect accessory for my daughter's outfit. There was one tiny problem.... the Fabric Wrap Bracelet comes in women's sizing. I simply sized down the length (and slightly on the width for the ring I found) for my daughter and it worked! I could probably take about a 1/2" off the length, but this just gives her room to grow. 😉 This was a SUPER quick sew so plan on making lots... ha!! It was a blustery 45-degree day here so I will be packing this outfit away for a few months, but I know my 8 year old will be wearing it the moment the weather warms back up. There are so many more fun patterns that I cannot wait to get to. The Miss Blossom Bunny Purse is definitely at the top of the list. As soon as I figure out Easter dress fabric, I will sew each of my girls one to coordinate. The Nori Dress will also be sewn as it gets closer to next summer because that dress is so fun and I love the funky vibes it exudes. I am also excited about the Big Day Out Denim Jacket because my daughter had one .... until she lost it. Although, she's probably outgrown it by now, but man, I loved using that jacket to coordinate with outfits I had sewn. What patterns are at the top of your list?! I love that One Thimble is more than just a group of patterns. The layout and photography is so inspiring. Each time I am blown away by the talent behind the scenes. I don't know how everyone else reads OT, but this issue, I was inspired to grab some guacamole and tortilla chips instead of my usual coffee. Regular Columns: Here you will find Trending Fabrics, the latest in the Stitches in Time story, Details about the Next Issue, Coupons & Discounts, etc. My favorite article in this section is Stitches in Time I cannot wait to see what happens next! The awesome thing is, I can go back to my previous issues and refresh my memory on the story thus far. I found myself nodding right along with this installment because it really happens in our online sewing community. Special Features: I really enjoyed reading 10 Tip for Faster Sewing. I am like the world's slowest seamstress (hence the many nights embroidering a seemingly small area) so this article has inspired me to implement some of the included tips. There may be hope! I also liked Sew Giving - Tiyamike Sewing. Jo is so inspiring and the gift she is teaching these women is immeasurable. Definitely a must read. The Handmade Christmas article brought back memories from my teenage years where my sister and I would pick a Christmas craft to make for gifts. I still have many of the creations we each made. In a world that has become so materialistic, I think it would be nice to gift from the heart rather than the wallet. Techniques & Tutes: There is a super awesome tutorial for a Fringe necklace which I totally would have made if I hadn't embroidered the crop top. It looks fairly easy and quick! There are also tips on working with trims and denim (both very useful in this issue). I know I have said this literally every single One Thimble, but this issue does not disappoint!! There are so many goodies and inspiring articles that I simply cannot list them all. For more One Thimble inspiration, visit the other blog tour stops!